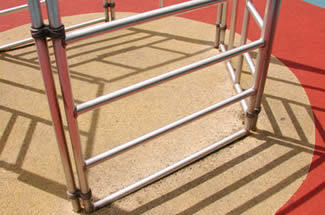 The image below is part of a piece of equipment found in the playground of a London school. What is the shape of its base? How would you describe it to someone over the phone? Where was the sun, that created such strong shadows, in relation to the 3D structure? Try to draw a picture of the whole structure from the information you have. You might also like to make a model of it and shine a light onto it to reproduce all the shadows. STEM - physical world. Visualising. Maths Supporting SET. Interactivities. Technology. 2D shapes and their properties. Generalising. Regular polygons and circles. Mathematical reasoning & proof. Cubes & cuboids.